In the January issue of The Next Truth we spotlight the personal experiences of ATLAS Higgs convener Prof. Dr. Bill Murray who was right in the center of the Higgs-boson discovery in July 2012, SETI's Institute’s weekly radio show “Big Picture Science” in where the host Senior Astronomer Dr. Seth Shostak reveals his thoughts; "Are we truly earthlings?" and... peer into the personal thoughts of Dr. Anindita Bhadra concerning the position of the female scientist. 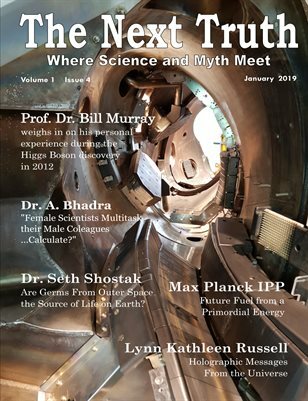 Also in this issue; Max Planck IPP's research for a future fuel in plasma's, a scientific theory of "The Fourth kind" and the introduction of shaman Tony Damian. Michael Murawski weighs in on the German ghost ship "The Renabau", spiritual coach Jacquelyne Ellis on animal energies in a multi-dimensional universe and author Lynn K. Russell makes an amazing connection between quantum physics and Global Consciousness.